Two summer reads FREE through Monday! 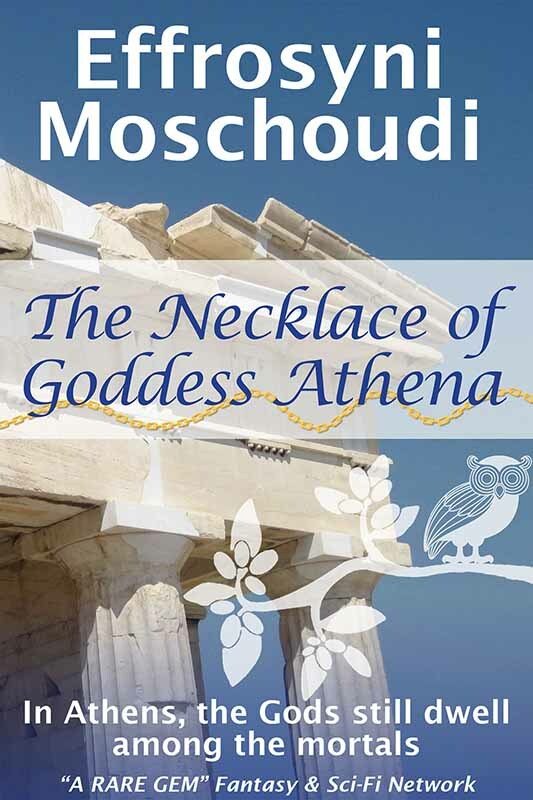 Today, I’m pleased to bring back Greek author Effrosyni Moschoudi, who interviewed here back in April. When she told me that all of her books were going to be free on Amazon this week, I couldn’t pass up the opportunity to spread the word. The sale runs through Monday, August 11. Read on for more information about her, about her books, and about this fleeting opportunity! Effrosyni Moschoudi was born and raised in Athens, Greece. 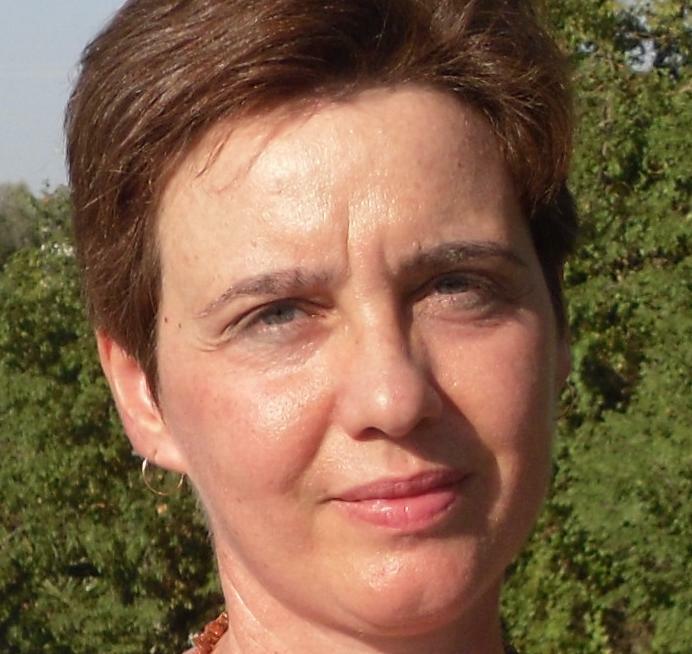 She has a BSc in Computer Science and has worked for large companies for twenty years, mainly in the hotel and airline business. She’s been writing since childhood and lives in a quaint seaside town near Athens with her husband Andy and a naughty cat called Felix. Her debut novel, The Necklace of Goddess Athena, is a fantasy adventure of Greek myths and time travel that’s suitable for all ages. It’s been described as a “Rare Gem” by the Fantasy & Sci-fi Network and has reached Amazon’s #1 in Mythology and #2 in Fairy Tales. The novel also made the shortlist in 2014 for the “50 Best Self-Published Books Worth Reading” from Indie Author Land. 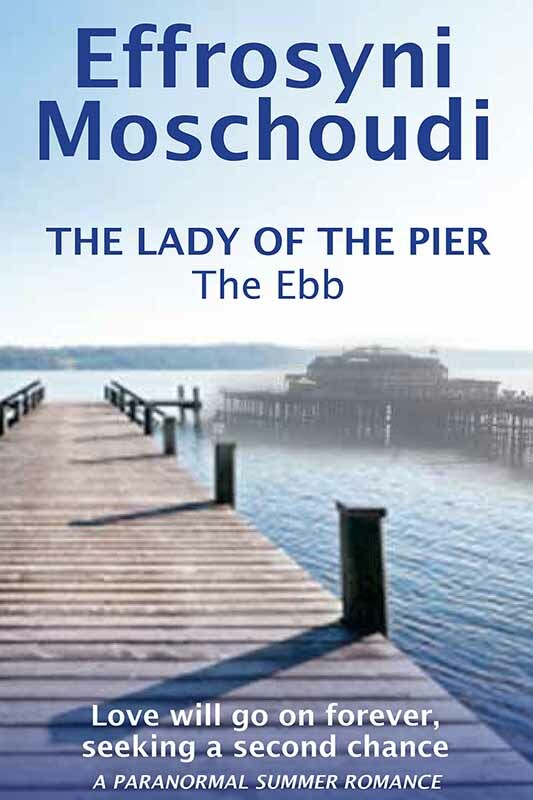 Effrosyni’s second novel, The Lady of the Pier—The Ebb, is an ABNA quarter-finalist. The book follows the lives and loves of two young girls who’ve never met but are connected in a mysterious way. It is the first part of a paranormal romance that’s set in Brighton (England) in the 1930’s and in Corfu (Greece) in the 1980’s. She is currently penning the second part of the series (The Flow), which she plans to publish in 2015. On her blog, Effrosyni presents the works of fellow indie authors with spotlights, interviews, and book reviews. She also posts her own content of various subjects, such as travel articles, inspiring personal accounts, tips for authors, and even some Greek recipes. Efimios is an ancient Greek and an unsung hero of Athens. He has saved the city countless times by undertaking time-travelling missions as instructed by Goddess Athena herself. Now an elderly man, he sends his son Phevos and his adopted daughter Daphne on a time-travelling quest to modern-day Athens. Mysterious as always, he only advises his children to look out for the signs without offering any explanations. Mystified, yet eager to obey their father’s will, Phevos and Daphne settle down in this new world, having been offered assistance by two orphaned siblings: Ksenia and Manos. New friendships and romantic love change their lives while their father’s covert purpose is gradually revealed. As the youngsters continue to unravel the secrets of their family past, inevitably they get caught up in the ongoing conflict between two Gods, one of which becomes their protector and the other, their worst nemesis. Who will prevail when the rival Gods meet again and will the mortal bystanders survive to tell the tale? Laura Mayfield leaves London with her mother Ruth in order to pursue a new life in Brighton. She finds employment at the West Pier Pavilion and soon falls in love with Christian Searle, one of the stagehands at the theatre. Laura aspires to a life of riches but this annoys and frightens the proud and insecure Christian, causing rows between them. When she is offered the chance to perform at the theatre, her love for Christian is put to the ultimate test. Charles Willard, a wealthy and arrogant aristocrat becomes fascinated by her and pursues her relentlessly, causing Christian to become enraged. Will Laura’s desire for wealth throw her in the arms of Charles or will her feelings for Christian prevail? Sofia Aspioti, a Greek student from Athens, arrives in Corfu for her annual summer holidays at her grandparents’ house, relieved to escape her overprotective parents’ care for a while. She takes on a job at the local water sports pier and when Danny Markson, a larger-than-life British tourist flirts with her, she is initially worried that his advances will cause her trouble with her strict family. Yet, by the time she realises that she’s desperately in love, she finds she no longer cares. When Danny returns home to a village near Brighton, Sofia becomes haunted by a series of dreams about the West Pier and a woman dressed in black. As if cast by a spell, she takes to writing poems about a love that won’t let go. Who is the grieving woman in her dreams and how is her sorrow related to her own feelings for Danny? For more information about Effrosyni, take a look at her website, www.effrosinimoss.wordpress.com, where she blogs about the writing life. She also loves getting in touch with readers on Facebook (authoreffrosyni), Twitter (@frostiemoss), and Goodreads. To view a trailer of her book, click here. 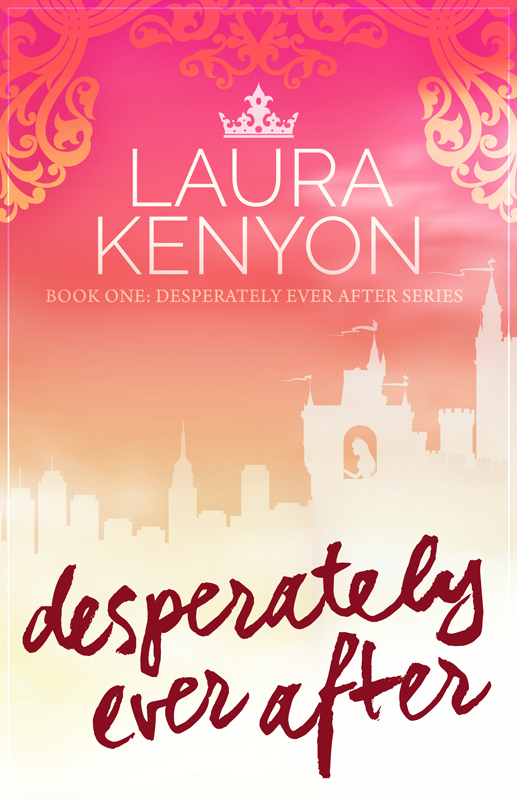 Desperately Ever After is a 2014 NIEA Chick-Lit Finalist and an Amazon Top 10 seller for both Women’s Fiction and Humor. Snag your copy before the sequel comes out in just a few weeks! 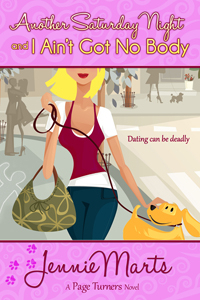 Author Jennie Marts is offering a free e-book of Another Saturday Night and I Ain’t Got No Body! The giveaway will remain open until 11:59 p.m. (PST) Tuesday, August 12, at which point a winner will be chosen at random. See yesterday’s post for details.